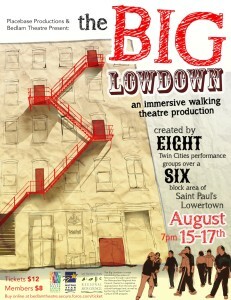 How does Lowertown, Saint Paul play on a summer evening? This year’s production of The Big Lowdown was a great success thanks to the work of over 60 artists from both Saint Paul and Minneapolis! We want to thank all of the wonderful staff at Bedlam Theatre for making this such a memorable production for everyone involved, including over 220 audience members who walked with our roving guides to see theatre all over Lowertown. We also want to thank the vibrant community of Lowertown, Saint Paul for opening your windows and doors to theatre. You make such a spectacle of yourself! See what our local press had to say about the performance! Click here to see more photos from the production!! There is a long-practiced tradition in Minnesota during the summertime. After dinner the kids rush outside to play evening games until the sun sets. The games are different in every neighborhood, since they tend to grow out of the playground landscape that is available. Some examples are: Moonlight Starlight, Ghost in the Graveyard, Kick the Can, Kiss and/or Kill, Spud, Sardines, Frying Pan, Croquet, Kickball, Freeze Tag, Baseball, Hopscotch, Jumprope, etc. etc. etc. In St. Paul’s Lowertown the tradition continues, and it’s not just for kids. Every night at 7:00 everybody goes out to play. The alleyways, parking lots and open spaces are full of games hat have emerged from the unique spaces of the neighborhood. You have most likely never seen these games before. It’s not that the people of Lowertown never grew up. They just never stopped playing. For this year’s Big Lowdown audiences got to experience the Lowertown Playground first hand. 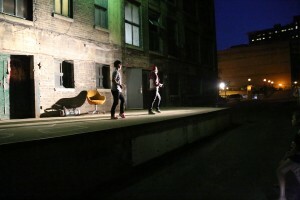 They walked to 8 different sites in Lowertown where performance groups had transformed that space into a playground. Audiences also met a cast of playful characters in between, including Lucy, Prince, and Donkey Kong. 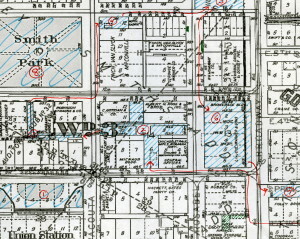 In partnership with Bedlam Theatre, PlaceBase sought to create a production that explores the potential for new forms of play in our neighborhoods and in our lives. This was our first production in the Twin Cities and the beginning of our mission to connect Twin Cities and Outstate theatre resources. We have so much to learn from one another about how theatre brings community together. See more photos of rehearsal by clicking the photo below.